telling you to get your wallet out. NOW WHAT do you do??? To decipher what that flashing light means – get this indispensable scan tool. The ALDL codes will point you in the direction of what may be wrong. You can then follow up instructions in a Service Manual on diagnosis and repair. For most people, this is adequate for general repair and maintenance. To “clear the codes” pull the ECM fuse in the fuse box for a couple seconds to reset the ECM (usually Fuse #1). IF you want to get more data from the car’s ECM - you can! 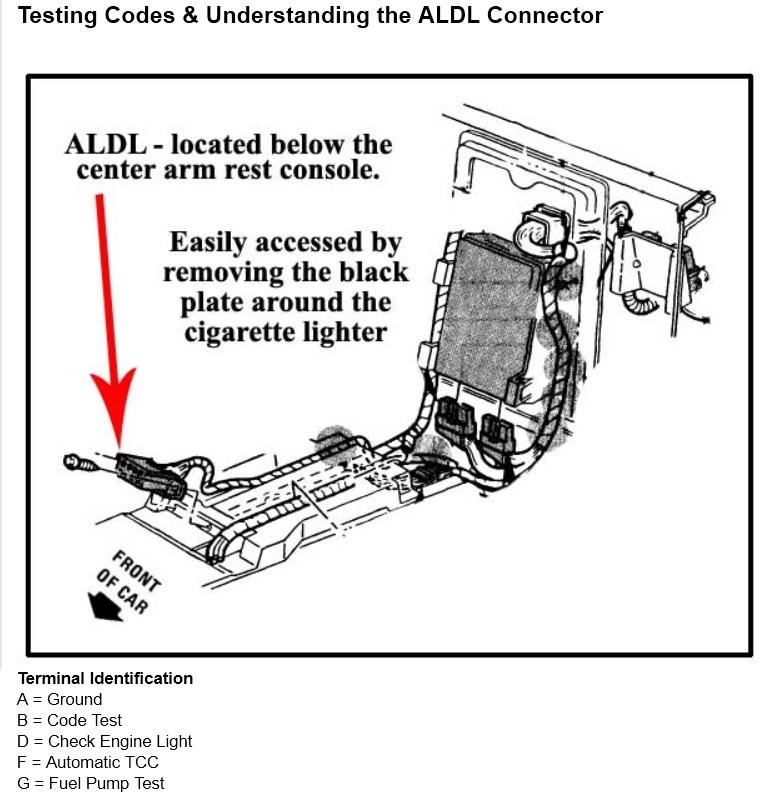 This ALDL port can also be accessed to provide real-time data of what your engine sensors “see”. For this, all you need is an ALDL interface cable to a computer and some software. All Fiero factory installed ECMs are the “160 baud” type. Also instructions on how to build an ALDL 160 baud interface cable. In configuration, set to correct ECM type. TunerPro is a much more advanced program intended for more than just scanning data. You will need 3 files to make this work. Your BIN and “Bin definition” files. Then get the BIN file – this is the program in your ECMs PROM chip. You can also look at the number on your PROM if you access the ECM under the center console. Registration to the Gearhead website is FREE – you can then access these files. Good stuff on general ALDL, PROM tuning, hardware, software etc. John Wilson's "How to Build a GM EFI System" and "Tuning Guide"
You may not want to build one, but his explanation of the sensors and what they do in the BIN is the best around. Nice reference. Here's some info on using android apps and hardware. Thanks for putting this thread up. I just got an SES light this morning on the way to work and will be using the 1st link you posted. By the way, there is actually one code that needs some revision. (Code 32 / EGR) Near the end of the paragraph it says basically that as long as it passes emissions and is running fine it is probably not worth chasing down the reason for the code 32 problem as it can be very difficult . Maybe so, but in CA that is not an option! Your car could be producing zero emissions but it doesn't matter. If that light is on, they will send you away without any further conversation. If you are using WinALDL, you absolutely need ALDLView to view the data. Your car could be producing zero emissions but it doesn't matter. If that light is on, they will send you away without any further conversation. I hope I don't violate some forum rule about getting around emissions regulations but I want to mention that it's a 5 minute job to take the check engine bulb out of the instrument pod. I have an '88 Formula with the usual exhaust flow improvement mods of ported manifolds, Y-pipe and low restriction cat. I didn't have any check engine lights until after I added a bored out throttle body. Then I started throwing codes and ended up with about 10 different problems according to the reader. I replace s a couple of sensors that COULD have been the problem according to info here and on other GM forums but the codes returned after reset. Throughout this the car was running better than ever. Smooth idle, peppier mid-range, no tailpipe smoke and the gas mileage was the same as before all the mods. So I gave up and took out the bulb. The past year of driving has been flawless and really enjoyable as the car continues to run perfectly. i know this is an old thread, but removing the bulb for the CEL will also result in a fail if you live in California or any state that uses california emission standards. they will do a bulb check at the begining if that fails they will fail you.